With Purim less than a month away, I decided to explore the world of Hamantaschen by breaking away from the classics! I have so many ideas that I am so excited to try and share how they turn out, from desserts to appetizers to full on dinners! It all begins tonight with a sweet-and-savory variety. I am a huge fan of sweet potato pizza, basically using a sweet potato ‘sauce’ instead of tomato sauce so I thought why not try something like that with my first savory hamantaschen. Round one is definitely a winner! 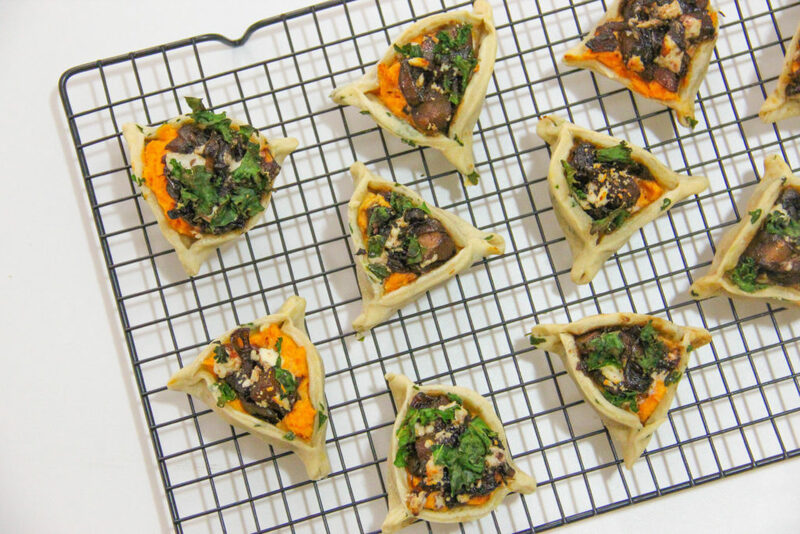 A combination of flavors comes together so well to make this unique Purim-themed appetizer a success! So let’s get into it. The orange “sauce” is a combination of mashed sweet potatoes, ricotta and a drop of honey. That serves as the backdrop for caramelized balsamic onion and pears for that sweet and savory taste, topped with creamy @naturalandkoshercheese cranberry-pecan goat cheese. Bits of baked kale on top give it that perfect crunch to really bring the whole thing together. A unique hamantaschen with a sweet potato & ricotta filling topped with balsamic onions and pears and sprinkled with goat cheese and kale chips for crunch. In a bowl mix together 2 cups flour, salt, and herbs. Add oil to the bowl and mix into flour with a spatula. Add 1/2 cup of water and mix in until it is absorbed. Add in little by little of the remaining flour and water until dough comes together. You may not need to use all the remaining flour and water. Gather dough in a ball and tightly cover in plastic wrap. Place in fridge and chill for one hour or overnight. Wrap the sweet potato in silver foil and place in the oven for 40-60 minutes, until softened. Alternatively you can buy canned sweet potato to skip this step. Heat a saucepan over medium-high heat and add the butter. When the butter has melted lower the flame to medium-low and add the thinly sliced onions, and sauté until the onions start to turn golden, around 4-5 minutes. Add the pear to the onions, stirring occasionally until caramelized and golden, around 10-15 minutes, making sure to not let the onions burn. Mix in balsamic vinegar and 1 tablespoon brown sugar and raise the flame a little and continue to cook until most of the liquid has been reduced. Taste and add more brown sugar to taste. When the sweet potato is soft enough to be mashed, place into a small mixing bowl and add in the ricotta, salt and honey. Mix well until smooth. It's time to prepare the hamantaschen! Remove the dough from the fridge and let sit 15 minutes at room temperature, it'll be easier to roll out when it's at room temperature. Prepare a baking sheet with parchment paper. Roll out the dough on a floured surface until it is around 1/4-1/8 inch thick, making sure not to let it get to thin that it will rip. Flour the rim of your round cookie cutter or drinking glass and cut circles from the dough. Gather the scraps, re-roll and cut. Place the rounds on the baking sheet. Spoon a little of the sweet potato into the center of the circle, add a little of the balsamic onions and pear, and top with a sprinkle of the goat cheese and small kale pieces. 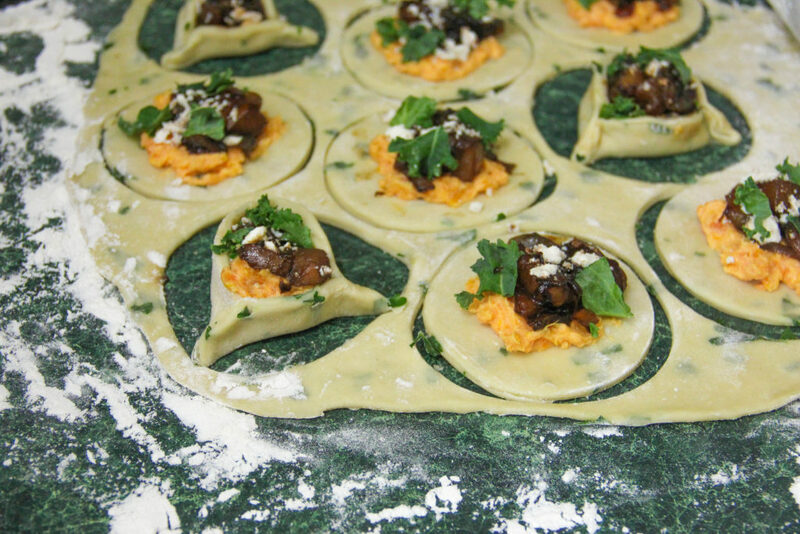 Pinch the edges together to create a triangle, using a little water to seal the dough. Make sure the dough is really sealed at the edges otherwise they may open up during the baking. Transfer the baked hamantaschen to a cooling rack and allow to cool. You don't want them to cool completely because these are best enjoyed warm!